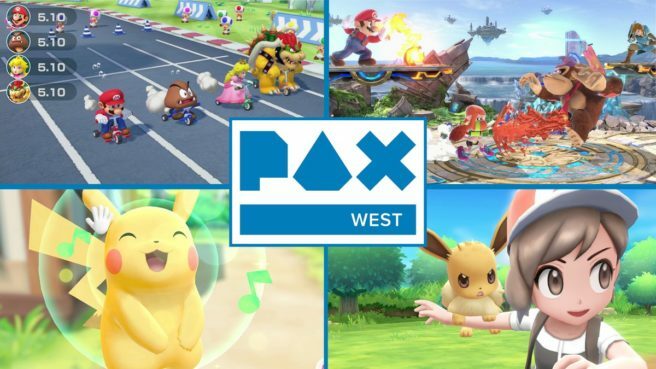 Nintendo announced the full lineup of games it will have on display at PAX West 2018 lineup, along with its other plans for the show. Travis Strikes Again: No More Heroes from Grasshopper Manufacture Inc.
On Aug. 31 and Sept. 1, fans that want to be Pokémon Trainers in real life can participate in a “Trainer Battle” scavenger hunt all around PAX West and nearby Seattle areas. The @NintendoAmerica Twitter account will tweet clues and/or photos of different locations where there will be two Nintendo street team members dressed as Pokémon Trainers, who fans can “battle” to receive a special item by answering a trivia question. The Pikachu and Eevee costume characters will also make a special appearance at the downtown Sheraton Seattle hotel on Saturday, Sept. 1. More details will be revealed soon. Nintendo’s booth will also be home to a giant mural inspired by Super Smash Bros. Ultimate. The massive banner will display all the announced fighters in the upcoming Nintendo Switch game and is a great place for fans to snap pictures and share them on social media. Fans who cosplay as a character from the game can even find their matching character and take a photo. Additionally, a new Nindies Showcase will premiere on Tuesday, Aug. 28, at 9 a.m. PT. The video presentation will highlight multiple unannounced indie games coming to Nintendo Switch. Watch the video live by visiting https://live.nintendo.com. On Aug. 31, Nintendo will host a get-together for fans to meet Kit and Krysta from the “Nintendo Minute” online show and play Super Mario Party. At the event, fans will be some of the first to get hands-on time with the upcoming Nintendo Switch party game (launching on Oct. 5), as well as have an opportunity to be on an upcoming episode of “Nintendo Minute.” Nintendo will select 30 attendees to attend on a first-come, first-served basis. Details about the time and location of the event will be shared in the coming days. PAX West 2018 will take place between August 31 and September 3 at the Washington State Convention Center at 705 Pike St., Seattle, WA 98101. Nintendo is located at booth No. #1939 in the South Hall.